Most of us spend a far portion of our days sat behind a computer. And whether that is for work or pleasure it can spell bad news for your back. Because sitting behind a desk for a couple of hours or more each day has been found to be a big cause of lower back pain in office workers. And don't forget the hours you spend on them after work replying to emails, using social media, playing games, or watching movies. And if you don't get into some good habits and get your desk and computer set-up right then you could be in trouble. So read on and I'll go through the 4 things you must do to ensure you can use a computer safely and minimise the risk to your back. But first let's look at why using a computer can be so bad for your back. Why Do You Get Back Pain At The Computer? Have you felt that all too familiar twinge in your back after being sat down at your computer for a while? And it doesn't stop with your back either. As your neck and shoulders also feel stiff, while your eyes start to feel strained and tired. Which all makes using a computer much more of a chore than it needs to be. So here are the four main reasons that your back doesn't like being sat behind a computer. The biggest problem people have when it comes to using their computers is the length of time they spend sitting in one position. ​Because not only does your body hate to be stuck in the same position for too long. So if you sit behind a computer regularly it can be a massive cause of lower back pain and one of the reasons for this is compressed vertebrae. Because your spine is made up of vertebrae and in between each of these vertebrae is a spinal disc. These discs do a great job for your back as they help to hold the spine together, facilitate it's movements, and absorb any shocks as you move around. So keeping them healthy is absolutely crucial if you want to stay clear of back pain. The problem is that to stay healthy these discs need you to be moving​ around. Because this is when they take in the blood, oxygen, and nutrients they need to stay strong. However, when you sit down at your computer these discs become compressed and as a result can't get what they need. And this leads to them weakening over time, which is a massive problem for your spine. Because it loses flexibility and the shock absorbing protection it needs to keep you free from pain. So you end up with back pain both in and out of your computer chair as a result. Sitting isn't just bad for your spinal discs. As it also has a weakening effect on your muscles, especially your core muscles which your back relies on for support. And this is bad news. Because your core muscles along with your glutes, hamstrings, and abdominal muscles all play a vital role in keeping your back supported and strong throughout the day. However, these muscles need activity to stay strong, healthy and be able to do that job. So, if you sit at the computer regularly these muscles can weaken and won't be able to offer the same level of support to your spine. Which will put your lower back under even more strain and pressure and will leave you in pain behind the screen. I can feel this guys pain from just looking at him! How you sit while at your computer will have a massive influence over whether you feel back pain or not. And unfortunately for many of us, we tend to sit with an unhealthy posture that puts our bodies under unnecessary strain. It's a bad habit that may be so deeply ingrained you probably don't even realise you are doing it. Looking down at the screen. Hunching or tensing your shoulders. Crossing your legs or feet. Sitting with your spine in a 'C' shaped curve rather than an 'S' shaped one. All of these things will put your lower back under much more pressure than it needs to be as you sit, so it's no wonder it gets angry! And you'll also feel pain and stiffness in your neck, shoulders, and upper back unless you get your sitting posture right. So it's vital that you work on doing just that when you're at the computer. ​The height of your desk and where things are placed on it will also affect the amount of strain your body comes under at the computer. As bad desk ergonomics have been found in studies to lead to many problems for office workers, such as pain in the back, shoulders, arms, wrists, and neck, as well as causing eyestrain. So you have plenty of reasons for making sure you get your desk set-up right! Having their desk chairs too high or too low. Sitting at a desk that's too low. Looking down at their computer screen or having it too close or far away. Having the keyboard and mouse too far away from their bodies. Overreaching for things that they use often. So the best way to make sure you avoid pain and repetitive strain injuries while using your computer is to get your desk and workstation right. And I'll explain how you can do just that in a moment. Up until now I've focused on the doom and gloom aspects of sitting behind your computer. But the good news is that sitting at your desk doesn't have to be a nightmare situation for your back. Because consciously adopting some good habits and re-adjusting your desk area can make a huge difference to your working experience. And you will end up with a far happier and healthier back as a result. So go through these tips one by one and try to implement as many of them as you can. Maintaining a good posture as you sit at the computer is so important because by doing so you will be taking lots of pressure and strain off your lower back. Improve your breathing, which helps your muscles to stay relaxed and free of tension and pain. Keep your body balanced so the pressure from sitting is spread evenly rather than being dumped on your lower back. Improve your mood and concentration making you more productive. So it's well worth the effort to try and improve your sitting posture. The aim here​ is to sit in a way that positions your body into a natural, comfortable and balanced posture that maintains an S-shaped curve in your spine. As this is the neutral position for your back and helps to reduce any strain and pressure on it. Watch your sitting angle - don't slouch or lean back. Instead sit with your back at a 90-100 degree angle to your legs and hips. Position your knees, legs, and feet - keep your hips parallel to the floor, your knees bent at a 90 degree angle, and place both feet firmly on the floor. Your head, neck, and shoulders - keep your chin up, look forward at your screen rather than up or down, and keep your shoulders relaxed. Be aware of your arms, hands, and wrists - sit close enough to your desk so you don't have to overreach for things, keep elbows close in to the body, and use chair armrests to relieve the pressure. And keep in mind that your body should feel relaxed in a good posture, rather than tense and uncomfortable, as this will help you stay on the right track. It's one thing learning how to sit with a good posture but if you get your desk set-up wrong then it'll be impossible to get rid of your back pain. Because having things at the wrong heights, distances, and angles will force you to strain as you work. And in many cases make it impossible to maintain a healthy posture. This takes a little work but it doesn't have to be difficult (or expensive). Some of the key aspects you need to do to achieve this are as follows. Position your screen correctly - it should be about arms length away and positioned centrally at a height where you can look straight ahead at it. Use a laptop stand - this raises the height of the screen so you can look ahead at it rather than down, keeping you in alignment. Adjust your seat height - your seat should be at a height that fits your desk but also allows you to keep both feet firmly on the floor. Use an ergonomic chair - sitting on an ergonomic office chair that can be adjusted to fit your like a glove is great for taking the pressure off your body. Make sure your desk is high enough - if your desk is too low it can't make it impossible to maintain a healthy sitting posture. Your keyboard and mouse - position these so they are close enough that you don't have to stretch to use them. Click here for more detail on how to set up your workstation to keep you healthy. So if sitting behind a desk when using a computer is causing all these problems then why not just stand up instead right? I mean standing desks are all the rage nowadays aren't they? Unfortunately as with most things regarding back pain it's not quite that simple. Because studies have shown that standing up for long periods of time can also lead to the development of lower back pain. So it seems like you just can't win sometimes! However, one solution is to do both. Because by splitting your time between sitting and standing at the computer you can get around the one thing your body (and back) hates the most. Which is being stuck in the same position for too long. However, to get good results you need to get the sit/stand ratio right. As another study found that when workers stood for 45 minutes and sat for 15 minutes every hour it had zero effect on their back pain. However when they sat for 40 minutes and stood for 20 minutes their back pain greatly reduced. So get your time ratios right and this can be an extremely effective tactic for beating back pain at the computer. And one way you can try this tactic for yourself either at home or at work is to buy yourself a sit/stand desk. These stands can be easily adjusted so you can get them to sit at the perfect height for you whether you are sitting or standing. 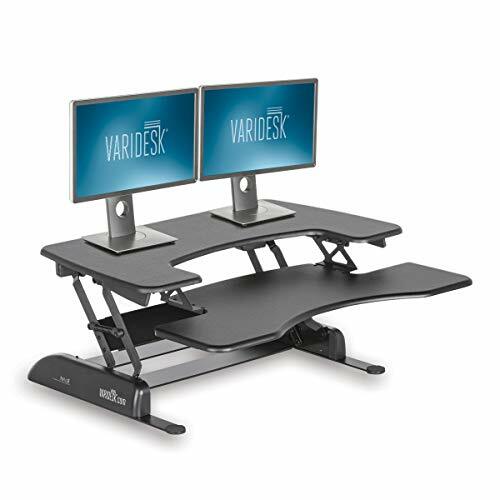 And the one I'd recommend is the Varidesk Height Adjustable Standing Desk. As this one has 11 different height settings so it's easy to position at the perfect height for you. Plus it has two different surfaces that mean you can keep your monitor and keyboard at different heights, which is vital for maintaining a healthy posture. Use your microbreaks to stretch and mobilise your body. I've already explained the dangers of sitting in the same position for long periods of time in this article. ​And this is what makes pain at the computer so common. However, there is a great way to get around these problems and that is by taking regular microbreaks from your chair. As by getting up out of your seat for 5 minutes every half an hour you are jolting your body back into life. And this is a great way to relieve the tension and pressure that has been building up while you've been sat down. Allowing you to reset the timer and start afresh after your microbreak is over. Simply getting up and out of your chair during your microbreaks isn't enough. Instead you need to use this time to mobilise and get some movement back into your body. As this will get your blood flowing again, reactivate your dormant muscles, and help your vertebrae decompress and your discs to take in some much needed oxygen and nutrients. So when the time comes for a microbreak try going for a walk rather than just getting up to make a coffee. Or give your body a good stretch out. As this will work wonders for alleviating any muscle stiffness and soreness and is a great habit to get into for your overall health. And for some ideas of what kinds of stretches you can do check out the video above. It can be all too easy to get caught up in what you are doing and forget to stop for a microbreak. I often do this myself when working ​on this site. As you can get into such a flow that you lose yourself in the writing only to realise that a few hours have zoomed past. So to make sure you never miss a microbreak you need to set yourself a reminder to stop every half an hour and take a 5 minute break. And a great way to do this is by setting an alarm on your phone or programming reminders into your computer. Sitting at your computer can become a real chore when it causes you back pain and discomfort. This happens for a variety of reasons such as sitting in the same position with a bad posture for hours on end, getting your desk set-up wrong, and using inadequate chairs. However, using your computer doesn't have to lead to back pain. As by getting your desk ergonomics right, sitting with a good posture, using an ergonomic chair, alternating between sitting and standing, and taking regular microbreaks you can be working more comfortably in no time. So don't allow your back to crash and burn at the computer. Take action today and take the pain out of your time sat behind your desk.